Personalized Medicine 8.0 (http://personalizedmedicine.sfsu.edu/), organized by San Francisco State University (SFSU) and its Biology Department Chairman Michael Goldman, Ph.D., will take place on Thursday, May 28, 2015, from 8:00 am to 6:00 pm at the South San Francisco Conference Center (http://www.ssfconf.com/directions-top), with a reception to follow. This year’s eighth annual event is entitled, “Genetic Screening & Predictive Medicine.” You may register for this one-day conference at http://personalizedmedicine.sfsu.edu. For additional registration information, academic and group rates, or to become a sponsor of Personalized Medicine 8.0, please contact dnamed@sfsu.edu. Early registration is $295; later registration is $495. The opening keynote address this year will be delivered by Rajesh Chopra, M.D., Ph.D., Corporate Vice President, Translational & Early Drug Development, Celgene, speaking on “Cancer: Predicting, Preventing, and Curing.” You may view the complete program at (http://personalizedmedicine.sfsu.edu/docs/pers_med_2015_program_singlepa...). Among the other speakers will be Jeffrey D. Pollard, M.D., Director, Medical Affairs, 23andMe; Stephan Morris, M.D., Scientific Founder and CSO of Insight Genetics, Inc.; Tristan B. Orpin, Senior Vice President and General Manager, Reproductive and Genetic Health, Illumina, Inc.; Nicole Miller, Ph.D., Director, Global Scientific Affairs, BioMarin Pharmaceutical Inc.; and Karoly Nikolich, Ph.D., CEO, Alkahest, Inc. The closing keynote will be delivered by Matt R.
Scientists at the Mayo Clinic, Jacksonville, Florida, have created a novel mouse that exhibits the symptoms and neurodegeneration associated with the most common genetic forms of frontotemporal dementia (FTD) and amyotrophic lateral sclerosis (ALS, Lou Gehrig's disease), both of which can be caused by mutations in a gene called C9ORF72. The study was published online on May 14, 2015 in Science. The article is titled “C9ORF72 Repeat Expansions in Mice Cause TDP-43 Pathology, Neuronal Loss, and Behavioral Deficits.” More than 30,000 Americans live with ALS, which destroys nerves that control essential movements, including speaking, walking, breathing, and swallowing. After Alzheimer's disease, FTD is the most common form of early-onset dementia. It is characterized by changes in personality, behavior, and language due to loss of neurons in the brain's frontal and temporal lobes. Patients with mutations in the chromosome 9 open reading frame 72 (C9ORF72) gene have all or some symptoms associated with both disorders. "Our mouse model exhibits the pathologies and symptoms of ALS and FTD seen in patients with the C9ORF72 mutation," said the study's lead author, Leonard Petrucelli, Ph.D., Chair and Ralph and Ruth Abrams Professor of the Department of Neuroscience at the Mayo Clinic, and a senior author of the study. "These mice could greatly improve our understanding of ALS and FTD and hasten the development of effective treatments." To create the model, Ms. Jeannie Chew, a Mayo Clinic Graduate School student and member of Dr. Petrucelli's team, injected the brains of newborn mice with a disease-causing version of the C9ORF72 gene. As the mice aged, they became hyperactive, anxious, and antisocial, in addition to having problems with movement that mirrored ALS/FTD patient symptoms. Despite a billion years of evolution separating humans from the baker's yeast in their refrigerators, hundreds of genes from an ancestor that the two species have in common live on nearly unchanged in them both, say biologists at The University of Texas at Austin (UT-Austin). The team created thriving strains of genetically engineered yeast using human genes and found that certain groups of genes are surprisingly stable over evolutionary time. The research, published in the May 22, 2015 issue of Science, paves the way for using humanized yeast to better understand genetic disorders and to screen drugs for treating the diseases. Although yeast consist of a single cell and humans have trillions of cells organized into complex systems, we share thousands of similar genes. Of those, approximately 450 are critical for yeast's survival, so researchers removed the yeast version of each one and replaced it with the human version and waited to see whether the yeast would die. Creating hundreds of new strains of yeast, each with a single human gene, resulted in many newly engineered strains -- nearly half, in fact -- that could survive and reproduce after having human genes swapped in for their ordinary ones. "Cells use a common set of parts and those parts, even after a billion years of independent evolution, are [often] swappable," said Dr. Edward Marcotte, Professor in UT-Austin’s Department of Molecular Biosciences and Co-Director of the Center for Systems and Synthetic Biology (CSSB). "It's a beautiful demonstration of the common heritage of all living things -- to be able to take DNA from a human and replace the matching DNA in a yeast cell and have it successfully support the life of the cell." The work has applications for human health in that some genetic diseases caused by mutations could be tested in new ways. The May 22, 2015 issue of Science features a special section on plankton that includes five articles describing major plankton-focused research efforts of the Tara Oceans expedition. These are the first results released by the multinational Tara Oceans Consortium, which used the 110-foot research schooner Tara, to sample microscopic plankton at 210 sites and depths up to 2,000 meters in all the major oceanic regions during expeditions from 2009 through 2013. The work, which included the largest-ever ocean sequencing effort ever undertaken, identified over 40 million planktonic genes, many completely new to science. The results also have implications for the measurement of global climate change, as well as other major implications. When you mention rich ecosystems that are vital for life on Earth, people tend to think of rainforests, but ocean plankton are actually just as crucial. The microscopic beings that drift on the upper layer of the oceans are globally referred to as "plankton;" together they produce half of our oxygen, act as carbon sinks, influence our weather, and serve as the base of the ocean food web that sustains the larger fish and marine mammals that we depend upon or draw delight from. "Beyond the cutting-edge science that was developed thanks to our collaborative work with the Tara Expéditions Foundation, this adventure is also about showing people all over the world how important the ocean is for our own well-being," says Dr. Eric Karsenti, Director of Tara Oceans, from the European Molecular Biology Laboratory (EMBL) and the French National Centre for Scientific Research (CNRS). Plankton are a diverse group of organisms that live in the water column and cannot swim against a current. They provide a crucial source of food to many large aquatic organisms, such as fish and whales. Many animals feed on seeds, acorns, or nuts. The common feature of these foods are that they have shells and there is no direct way to know what's inside. How do the animals know how much and what quality of food is hidden within? A simple solution would be to break the shells, which often takes time and effort -- it would be a big disappointment to know that it's rotten or bad after the hard effort of opening the nuts! Can animals evaluate the food hidden inside the nuts? This is especially important for some animals who cache the food items for later use without opening and checking each item. We can detect which one is heavier by moving the items up and down several times and focusing on the "feeling of heaviness" we perceive. Humans can also detect the quality of a water melon by knocking on it. 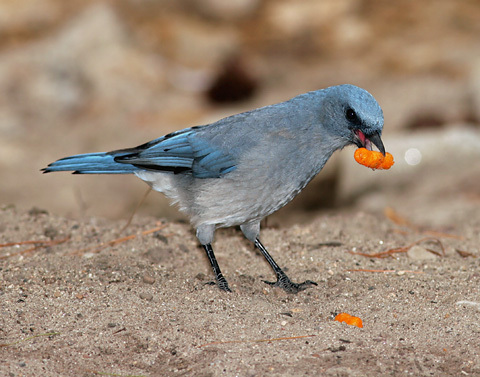 A new study published in Journal of Ornithology suggests that some birds can also use similar tricks in choosing which peanuts to pick from the feeder. The article is titled “Proximate Mechanisms of Detecting Nut Properties in a Wild Population of Mexican Jays (Aphelocoma ultramarina).” The study was carried out in Arizona by an international research team from Poland and Korea, and it revealed that the Mexican Jays (Aphelocoma wollweberi) may be able to "weigh" peanuts and may even be able "listen to" peanuts while handling them in their beaks. Dr. Sang-im Lee, Dr. Piotr Jablonski, Dr. Maciej Fuszara, and Dr. Elzbieta Fuszara, the leading researchers on this study, together with their students and helpers, spent many hours delicately opening shells of hundreds of peanuts, changing the contents and then presenting them to the jays in order to see if the birds can figure out the differences in the content of identical-looking peanut pods (peanuts in the shell). An extract from the thunder god vine (Tripterygium Wilfordi ), which has a long history of use in traditional Chinese medicine, reduces food intake and causes up to a 45% decrease in body weight in obese mice. The weight-loss compound, called Celastrol, is a pentacyclic triterpene extracted from the roots of Tripterygium Wilfordi that produces its potent effects by enhancing the action of an appetite-suppressing hormone called leptin. The findings, published in the May 21, 2015 issue of Cell, are an early indicator that Celastrol could be developed into a drug for the treatment of obesity. The Cell article is titled “Treatment of Obesity with Celastrol.” "During the last two decades, there has been an enormous amount of effort to treat obesity by breaking down leptin resistance, but these efforts have failed," says senior study author Dr. Umut Ozcan, an endocrinologist at Boston Children's Hospital and Harvard Medical School. "The message from this study is that there is still hope for making leptin work, and there is still hope for treating obesity. If Celastrol works in humans as it does in mice, it could be a powerful way to treat obesity and improve the health of many patients suffering from obesity and associated complications, such as heart disease, fatty liver, and type 2 diabetes." Leptin is a fat-cell-derived hormone that signals to the brain when the body has enough fuel and energy. Humans and mice that lack leptin signaling eat voraciously and become morbidly obese, suggesting that leptin-enhancing drugs may be effective for treating obesity. But leptin does not reduce hunger or food intake in obese individuals despite high levels of the hormone in the bloodstream, leading many researchers to speculate that leptin insensitivity is the root cause of obesity. Genetic material from fungi collections at Purdue University in the United States and at the Royal Botanic Gardens, Kew, in the UK helped a team of researchers resolve the mushroom "tree of life," a map of the relationships between and among key mushroom species and their evolutionary history that scientists have struggled to piece together for more than 200 years. 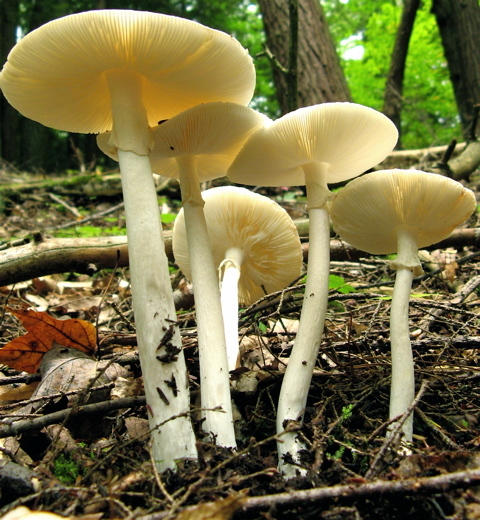 The group used DNA from frozen, heat-dried and freeze-dried specimens to analyze a dataset of 39 genomes representing most of the known families in Agaricales, the order that includes some of the most familiar kinds of mushrooms, including cultivated edible mushrooms, magic mushrooms, and the deadly destroying angel (image). High-throughput sequencing technology allowed the scientists to define seven new suborders and the "trunk" of the Agaricales tree, providing a framework for testing hypotheses of the evolution of mushrooms. "Mycology really is one of the last frontiers in biology," said Dr. Catherine Aime, Associate Professor of Mycology at Purdue. "We know there are 6 to 20 times more species of fungi than plants, but we don't really know much about them. People have tried to figure out how mushrooms are related since the time of Linnaeus. It's gratifying to finally solve this mystery." Fungi are essential to the health of ecosystems, plants, and animals. They decompose fallen wood and other organic matter, breaking down material and freeing up nutrients for other organisms. Most land plants rely on beneficial fungi to deliver water and other nutrients, and the gut fungi of ruminants such as cows play a vital role in digestion. Most humans also host fungi, which help maintain the balance of our natural flora. But despite their importance and rich diversity, comparatively little is known about fungi. Many species have "cryptic and unpredictable life histories," Dr. If you have a map, you can know where you are without knowing which way you are facing. 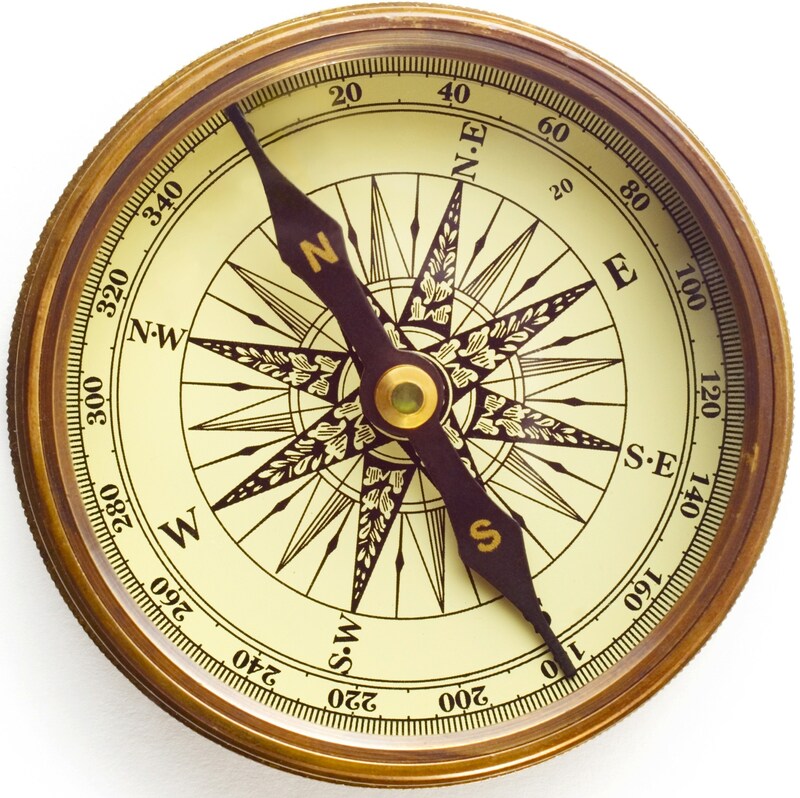 If you have a compass, you can know which way you're facing without knowing where you are. Animals from ants to mice to humans use both kinds of information to reorient themselves in familiar places, but how they determine this information from environmental cues is not well understood. In a new study in mice, researchers at the University of Pennsylvania (Penn) have shown that these systems work independently. A cue that unambiguously provided both types of information allowed the mice to determine their location, but not the direction they were facing. The study, published in the May 19, 2015 issue of PNAS, was conducted by graduate students Joshua Julian and Alexander Keinath, Assistant Professor Dr. Isabel Muzzio and Professor Dr. Russell Epstein, all of the Department of Psychology in Penn's School of Arts & Sciences. "When you're lost," Dr. Epstein said, "how do you reestablish your bearings? People have been studying this for more than 25 years, but they have not focused on the fact that place recognition, figuring out where you are, and heading retrieval, figuring out which way you're facing, could be two separate systems." The team's experiment was an updated version of one of the original studies of reorientation, conducted at Penn by psychologists Dr. Ken Cheng and Dr. Randy Gallistel in 1986, which showed that rats use the shape of a room, but not other kinds of informative features, to get their bearings. To show this, the researchers in the 1986 study used a small rectangular room that had cups in each corner in which food could be hidden. From the bird's-eye view of the researchers, the food was always hidden in the northwest corner. Scientists have for the first time shown how the disruption of a key gene involved in mental illness impacts on the brain. The discovery could be used in the future to help develop psychiatric drugs. Disruption of the DISC1 gene is a known risk factor for a number of major mental illnesses, including schizophrenia, depression, and bipolar disorder. Brain imaging studies have already revealed that these illnesses involve alterations in both the structure and connectivity of the brain. Genetic studies of several generations of one Scottish family affected by these psychiatric illnesses have revealed these illnesses are connected to the disruption of the DISC1 gene, though it is not clear how. Now, for the first time, neuroscientists have shown that the disruption of this key risk gene significantly modifies the organization of functional brain networks. Lead researcher Dr. Neil Dawson from Lancaster University in the UK said: “Our data strongly suggest that disruption of DISC1 is a key molecular event that can contribute to the emergence of disease-relevant alterations in brain function. Through these studies we have been able to define deficits in brain function and functional connectivity that result from the disruption of DISC1 and are relevant to a range of psychiatric disorders.” He said these included schizophrenia-related alterations in brain function, functional brain network connectivity, and the functioning of the glutamate neurotransmitter system. These findings parallel alterations seen in the brains of schizophrenia patients and could pave the way towards the development of new drug treatments. The research was published online on May 19, 2015 in an open-access article in Nature’s Translational Psychiatry. Blood-pressure-lowering drugs do not improve life expectancy among adults with diabetes and kidney disease, according to a new study of the global evidence published in the May 23, 2015 issue of The Lancet. The article is titled “Comparative Efficacy and Safety of Blood Pressure-Lowering Agents in Adults with Diabetes and Kidney Disease: A Network Meta-Analysis.” However, the study, which brings together 157 studies involving more than 43,000 adults with diabetes, shows that angiotensin-converting-enzyme (ACE) inhibitors and angiotensin-receptor blocker (ARB) treatments, alone or in combination, are the most effective drug regimen for preventing end-stage kidney disease -- an important finding given that diabetes is now the leading cause of people starting dialysis. 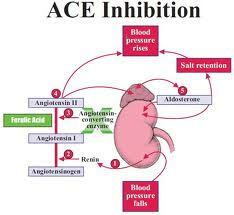 This finding is important because until now it has not been known whether any available treatment can protect kidney function in the long term, and combination therapy of an ACEi and an ARB has been thought to cause harm. While treatments in the new study have been shown to help patients, the study also shows that any benefits of treatment need to be balanced against potential side-effects. In fact, the study provides a unique opportunity for busy clinicians, who simply cannot read all the literature, to review existing evidence which has been analyzed using the highly innovative technology of network meta-analysis. This measures specifically both the benefits and harms of all available treatments and provides a ranking of the most effective interventions.